Just one slip while detailing can leaving a permanent mark: we’ve all smeared a little wax on plastic and rubber parts on bumpers, mirrors, and doors. The wax seeps into the textured plastic and porous rubber parts, leaving a chalky white stain that just won’t come out. Everyone seems to have a home remedy for the problem, but they all involve bathroom scrubbers or sandwich ingredients in place of professional grade products. Now Chemical Guys introduces Trim Clean Wax And Oil Remover For Trim, Tires, And Rubber. Trim Clean is the only product that helps dissolve and remove embedded wax, glaze, sealant, or polishing compound from plastic and rubber car parts. Easily erase white wax stains from textured plastic and porous rubber trim pieces found all over door mirrors, bumper parts, window seals, front end grilles, side vents, and windshield trays. Simply work the solution over the affected area with a soft scrubbing brush or microfiber towel to break down waxy residues, then agitate them out from deep within the surface. 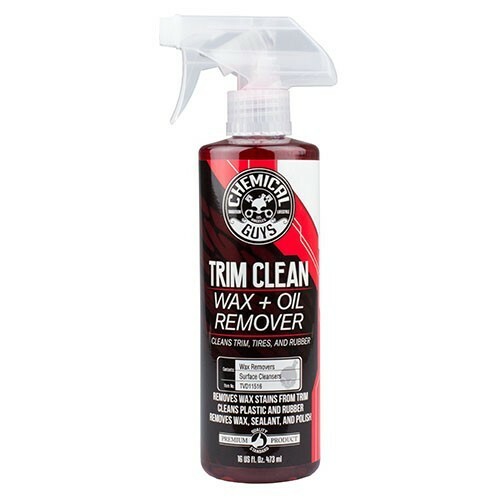 Trim Clean Wax And Oil Remover restores a natural look to trim pieces by removing waxy oils that stain and discolor them. Now a small misstep during a full vehicle detail or weekly car wash is no longer a permanent mark. Use immediately after wax accidents for maximum effect. Erase wax, sealant, or polish stains from trim, plastics, and rubber car parts with Chemical Guys Trim Clean Wax And Oil Remover. Spreading wax over paintwork, glass, clear plastic, and polished metal parts is essential for protection and enhanced glossy shine. Natural and synthetic waxes seal up the pores of these surfaces and protect the material from harsh UV sunlight, pollution, and even water spots and bird droppings. But wax, sealant, and polish do not belong on unpainted textured plastics or rubber parts found all over the car. Smearing wax over door mirror parts, bumper trim, window moldings, antenna bases, tires, and door handles can forever ruin the deep-black look with white hazy stains. Chemical Guys Trim Clean Wax And Oil Remover helps dissolve and remove set-in white stains from plastic and rubber car parts. Simply work the solution over textured black plastics to remove the wax residue and make them look new again. Now your bumpers, tires, grilles, moldings, and vents can look fresh and stain-free, like they should, thanks to Chemical Guys Trim Clean Wax And Oil Remover. Textured plastic and rubber trim parts on your car look solid, but they are more porous than paint or glass under a microscope. These pores, peaks, and valleys are much larger than wax or sealant molecules, which makes it easy for any paste or cream wax to fill them up. As the wax dries, it leaves white streaks and stains that are nearly impossible to remove. Chemical Guys Trim Clean is highly refined and easily penetrates deep into textured plastic and rubber parts to dissolve wax, glaze, sealant, and polishing compounds. Detailers used to try and hide wax stains with lots of trim dressings, but the white spots kept coming back. Chemical Guys Trim Clean permanently erases and removes wax spots and stains from plastic and rubber trim on bumpers, grilles, vents, louvers, fender flares, windshield trays, window moldings, door frames, and tires. Once the offending white stains are dissolved and removed from porous plastics, nourish the plastics and rubbers with your favorite Chemical Guys dressing to restore a new look and feel. Wax stains plastic trim with ugly white splotches and spots. When detailers couldn’t clean trim stains, they traditionally slathered it with extra coats of dressing to try and hide the unsightly white haze. The problem is the dressing eventually fades away, and you’re still left with white stains all over textured plastic and rubber parts. Chemical Guys Trim Clean Wax And Oil Remover actively dissolves, cleans, and removes dried up wax from plastic and rubber trim pieces. Physically breaking down the offending particles and cleaning them from the surface results in a permanent fix, and total removal of the ugly white spots on any car part. Remove wax, sealant, glaze, compound, or polish stains from exterior parts to make them look fresh and new again. Avoid replacing expensive bumper trim, window moldings, windshield cowls, front grilles, side vents, fender flares, or rear hatch louvers just because of some old dried up wax. Clean up the problem with Chemical Guys Trim Clean, and enjoy the bold look of clean trim as it was meant to be. Note: This product dissolves wax, glaze, and sealant. Avoid contact with paintwork to keep any wax coatings intact, and reapply wax as needed.